Some TV shows get really popular and the babies and kids from those TV Shows get even more popular. On this page I am sharing Free Printable Match the Baby with the TV Show Game. I am sharing names of 11 different baies and also the names of 11 different TV shows. I have made this game in 3 different colors. How to Play: Give each guest one printed game card and a pen or pencil. Ask the guest to match the name of the baby with the TV show in which the baby was starred. I am sharing the answer key to this game at the end of this page. The person with most correct answers will be the winner. Here is this free printable game card for this fun, modern and unique game in an adorable pink color. Just click on the thumbnail and a bigger image will open up. You can print as many copies of that image as you like but only for your personal use. This is another adorable color for this fun baby shower game. You can print this game in blue color for boy baby shower. Just click on the thumbnail and a bigger image will open up that you can save or print. Green is a gender-neutral color so I have also made this game in this baby green color. You can print this game in green if it matches the theme of your baby shower party. 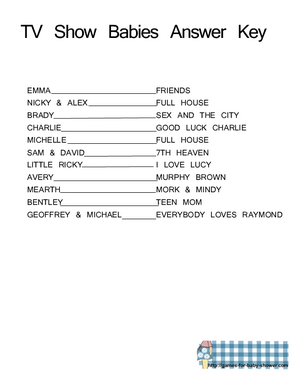 Here is the answer key to this free printable baby shower game. You can keep this image in your phone or tablet too so you can check the answers given by the guests.